For many cultures we have just begun a new year. In Kemet, however, the New Year and its celebrations were not fixed, because New Year’s day was on the first full moon after the appearance of Sothis (Greek Sirius), which we now refer to as the ‘Dog Star’. The first day of the new year was celebrated as the birth day of one of the sun gods: Ra Horakhty (below), who combined the powers of Ra and Horus of the Horizons. In this way the god was associated with rebirth and fertility, important factors relating to the Kemite New Year. 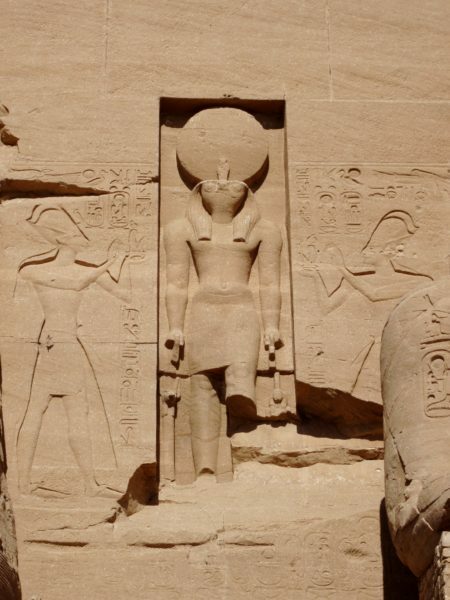 Representation of Ra Horakhty (centre) at Abu Simbel Temple. The new year commenced with the season of flood; the remainder of the year was divided into seasons of: sowing (crops) and a season of summer. Each month had a number of religious festivals. In addition to celebrating the birth of Ra Horakhty, the first month of the year included offerings to the god Hapy (who was the god of the inundation). The flood typically occurred between late June and late October. It was essential for the prosperity of Kemet. 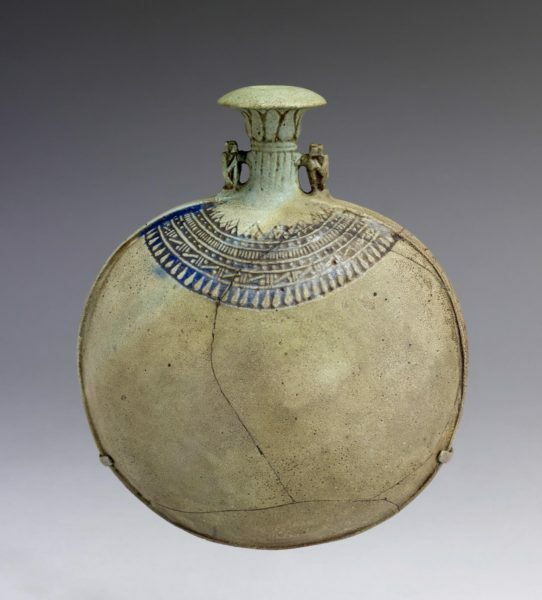 Special New Year flasks from the Late Period (around 746-332 BCE) have survived. These were made out of faience (crushed quartz which was fired at very high temperatures with a finished glazed) and were dedicated on the first day of the New Year. They were filled with sacred water (below). The people of Kemet believed that the flood represented the tears of Iset (Isis) when she mourned the death of her brother and husband Wsir (Osiris). 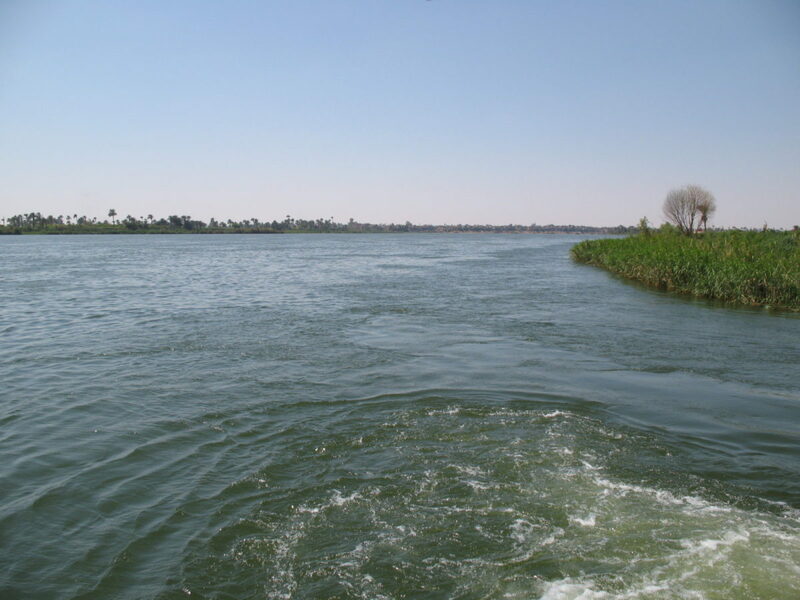 During the annual flood the King of Kemet was forbidden to travel by boat on the River Nile. 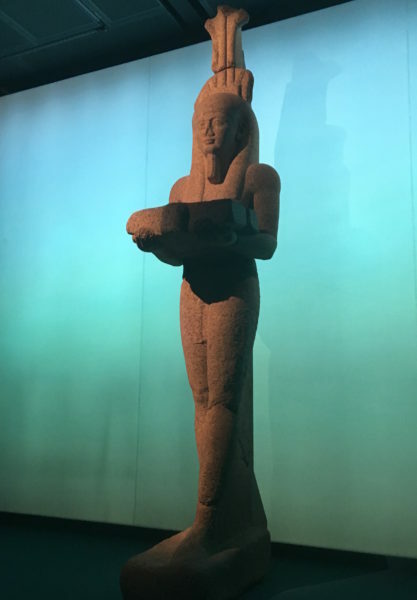 This tradition was still in place when the Roman Emperor Hadrian arrived in Egypt in 130 CE, he had to wait until the flood had ended before he was permitted to embark on his journey south on the Nile. The first season of the new year was named Akhet and the first month Tekh or later Dhwt (Thoth). This is probably why on the handles of the flask above we see two baboons; this was one of the forms that the god Dhwt/Thoth took. The original calendar was closely connected to the natural phenomena that occurred in Kemet and which were so vital to everyone’s existence, from the King to the farmers. The complexity of the calendar (which Europe adopted) and the ancient Kemite knowledge of the solar system were integral to the New Year. They are, of course, testimony to African knowledge and science.